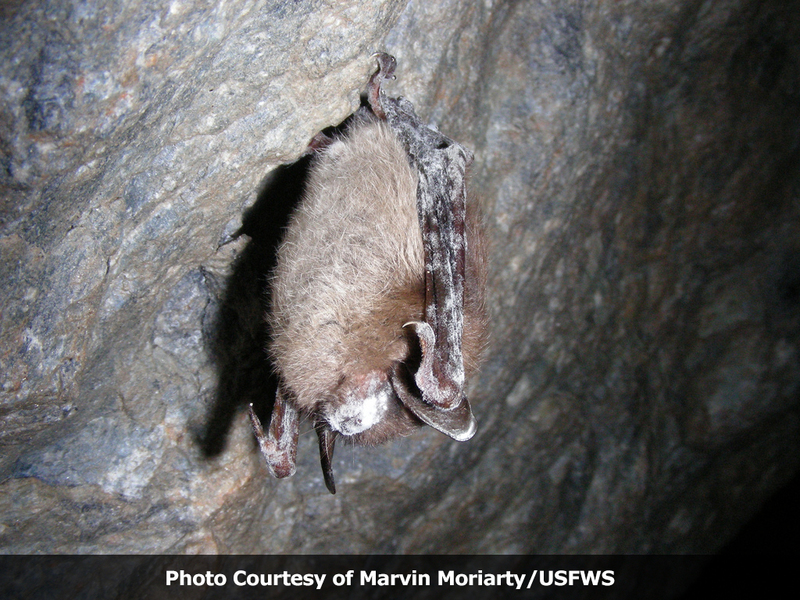 1 – White-nose syndrome has been confirmed in Michigan bats. Little brown bat; close-up of nose with fungus, New York, October 2008. Credit: USFWS. The Department of Natural Resources says the serious disease has been detected for the first time within state borders. White-nose syndrome has been found in three Michigan counties: Alpena, Dickinson and Mackinac. The fungus is known to cause significant rates of illness and death in North American bats. The DNR and partner organizations are now shifting gears from surveillance to working to stop the spread. Five little brown bats showing disease characteristics were collected in February and March by researchers from Eastern Michigan University. The disease was first documented in 2006 in a cave in upstate New York. Eleven species of bats have been infected and more than 6 million have died. There are no known harmful effects to humans from White-nose syndrome. But the DNR says the loss of bats due to the disease could be economically significant for agriculture and commercial forestry, leading to an increase in pests that are harmful to crops and trees. Bat die-offs can be reported through an observation report on the DNR website at www.michigan.gov/wildlife or by calling the DNR at 517-336-5030. 2 – The Tawas Point Birding Festival is May 15-18 in Iosco County. The ninth annual festival will be based at the Tawas Bay Beach Resort in East Tawas. The Michigan Audubon Annual Conference will be held at the same time. The Tawas Point festival will feature guided birding walks at area hotspots, along with programs and talks by some of Michigan’s leading wildlife experts. Some events are already sold out. Tawas Point is a spring destination for birders from around the country and the world. The “Point” is well known for high concentrations of migrating warblers during the month of May. More than 200 species of birds were recorded during the festival weekend in 2013. 3 – The city of Bay City has plans for Earth Day. The 20th annual Ed Golson compost event is Saturday, April 26, at Veterans Memorial Park. It starts at 8 a.m., and ends when the compost is gone. Little League teams will be collecting donations to offset their utility expenses. The compost can be shoveled, and it’s known as “black gold” for the benefits it brings to gardens. There’s also a “Clean Up Bay City” event on April 26, sponsored by the mayor and city neighborhood groups. That’s from 9 a.m. to 2 p.m., with opportunities for residents to recycle and reduce their excess bulk trash. ReLeaf Michigan also will have a pick-up location at Bay City Electric Light & Power for people who that have purchased trees for planting. More information is available on the city’s website, at baycitymi.org.